A clear message from anti water charges campaigners. People from towns and villages all over Clare converged on O’Connell Square in Ennis this afternoon (Saturday) for the latest in a series of public protests against the imposition of domestic water charges. 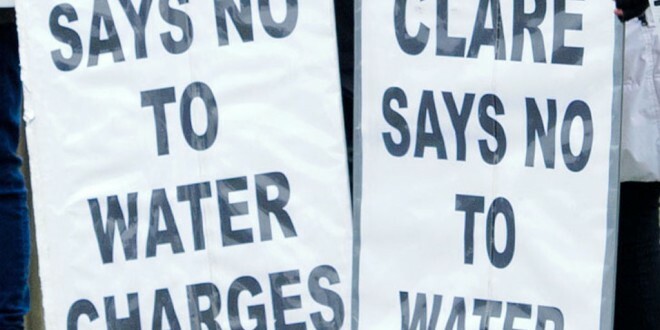 Protesters from other counties also attended in a show of solidarity with Clare Says No To Water Charges and other like-minded groups and individuals, who are standing resolute on the issue. Tony Murray,Ennis, taking part in a Water Charges Protest at the O’Connel Monument on Saturday.Pic Arthur Ellis. The message, which was impressed upon Taoiseach, Enda Kenny, when he witnessed anti-charges protesters on his visit to Ennis and Shannon earlier this week, was reaffirmed by a number of speakers this afternoon. This is the third major anti water charge rallies in Ennis and comes at the end of a week, where there were stand-offs in housing estates and individual homes around the county between householders and personnel attempting to install meters, on behalf of Irish Water. In some instances, the installers, after staying around for some time, packed up and went home; with a handful of places already dug up, where they couldn’t progress any further. Gardaí were on hand at some locations but no trouble was reported. The scaling back of the charges, which will capped be until 2018, and the time delay in implementation until January 1, has done little to quell the anger of those opposed to the charges. 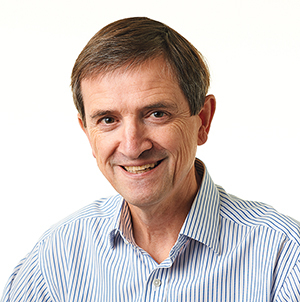 Many argue that the Government is squeezing enough from people’s pockets by way of direct taxation without having yet another bite out of income. 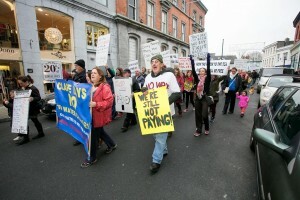 Water Charges Protest in Ennis on Saturday.Pic Arthur Ellis. Their response is still, “ Clare says to to water charges” and “We won’t pay”. 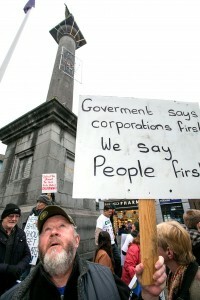 These were among the chants to be heard in the Square and as the protestors wormed their way around Ennis.